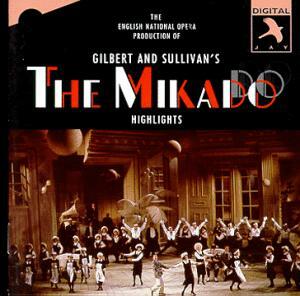 This recording/video is based on a controversial production that Jonathan Miller directed for the English National Opera. 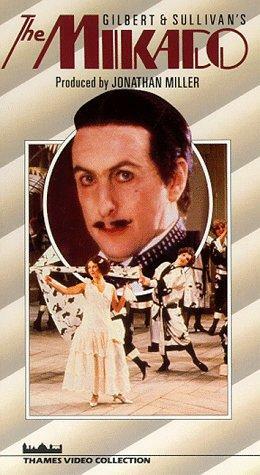 The action of the opera was transferred to an English seaside hotel in the 1920s. I must confess that I did not originally care for the production, but a revival at the New York City Opera in the fall of 2001 persuaded me that Miller's wacky vision was compelling theater in its own right. I believe Dudley Moore played Ko-Ko in one or more of the revival seasons. Richard Suart has played it frequently in recent years, including the aforesaid revival at the New York City Opera in 2001. 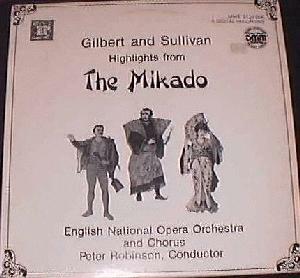 The recording is of substantial excerpts, but not the complete opera. It is not likely to be anyone's first choice, but collectors who already have a Mikado or two may find it a refreshing change of pace. The video is superbly done technically, so it comes down to whether you approve of Miller's vision of the opera. Ko-Ko: Are you old enough to marry, do you think? Ko-Ko: Won't you wait until you're eighty in the shade? And, she sounds like she can't wait for the honeymoon, probably leaving Ko-Ko even more frightened. It's very very funny. I found the production to be a revelation, and I loved every minute of it. Bell-boys, tennis rackets, BBC accents, pilots, the lot. I have since seen the production twice in the theatre, and would have no hesitation in attending again should it have another revival. The only disappointment was that Eric Idle was replaced by this time, by the gentleman who for some explicable reason is now considered to be Mr. G&S himself. 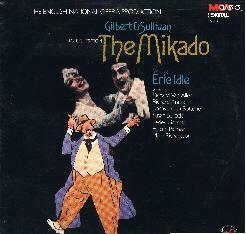 My wife and I just reeled home in astonishment from opening night of the Miller Mikado revival [at New York City Opera —ed.]. I was searching around on the Internet for some rhyme to this unreason, and came across your basically positive review. As a director of theater and opera in NYC, I'm not easily affronted by the antics of other directors. If I had to classify myself, I would say that I'm a neo-traditionalist, preferring to re-examine productions from the ground up and be guided by the music and the text, but not dogmatically so. Above all, I have an abiding faith in the particular genius of the composer for whom I choose to work. But obviously, Jonathan Miller has none. While I've never thought his directing worth his fame, there was always some intelligence behind it, and that seemed to balance his "look at me" updating and literalizing (most objectionable in his MET Pelleas) techniques. But he obviously hates The Mikado...loathes it. I don't know what odds and ends the restaging director added in for this current production, but Miller couldn't have made the company work harder in distracting the audience from the story. Almost every song was ripped out of context for gags that had nothing to do with the plot and the totally extraneous dancers were criminal, especially at the end of the "To sit in solemn silence" trio. I could go on and on, but mercifully, I won't. You've seen it. Peter G. Davis describes this production (positively) as "Gilbert and Sullivan for those who hate Gilbert and Sullivan — which includes most card-carrying British intellectuals, Miller clearly among them." And I think that's the problem. If you hate it, are bored by it, are tired of it, for God's sake don't direct it! I would have rather watched any incompetent and overwhelmed community theater mangle the text and lyrics more than I would an eminent, intelligent, world-renowned doctor-director kill this best of comedic operettas. And maybe that's my problem. I haven't seen good G&S in a very, very long time. My wife and I have curtailed three different Mikados short (two at NYCO, one at NYGASP) due to the fact that they became painful to watch (and hear!) And maybe I imprinted on the Martyn Green recordings (which you in your brilliance produced and annotated, thank God!!!) in which the humor was amazingly embedded in the lyrics, text, and music.